A moist banana bundt cake with sweetened coconut throughout, topped off with a tart lime glaze. Preheat oven to 350°F. Grease an 8-inch (6 cup) bundt pan well with baking spray. In a large bowl or stand mixer, beat together granulated sugar and butter. With mixture running on low, add one egg at a time, followed by vanilla and optional rum extract. Mix in yogurt and banana until smooth. Add flour, salt, and baking soda, mixing until there are no streaks. Finally, mix in shredded coconut. Transfer to prepared bundt pan. Bake for 55-60 minutes or until cake is a deep caramel and a toothpick inserted comes out clean. Cool for 5 minutes before inverting on a plate or wire rack to cool completely. In a small bowl, beat together powdered sugar with 1 Tbsp fresh lime juice and enough water to create desired icing consistency. 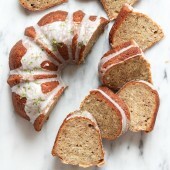 Plate bundt cake, drizzle with icing and sprinkle with fresh lime zest. Slice and serve. Store remaining cake in an airtight container for up to several days. *A 9x5-inch loaf pan may be used in place of an 8-inch bundt pan.